The Detroit Lions visit the Tampa Bay Buccaneers in Week 14 of the 2017 NFL season. PFF previews the top player matchups of the game. 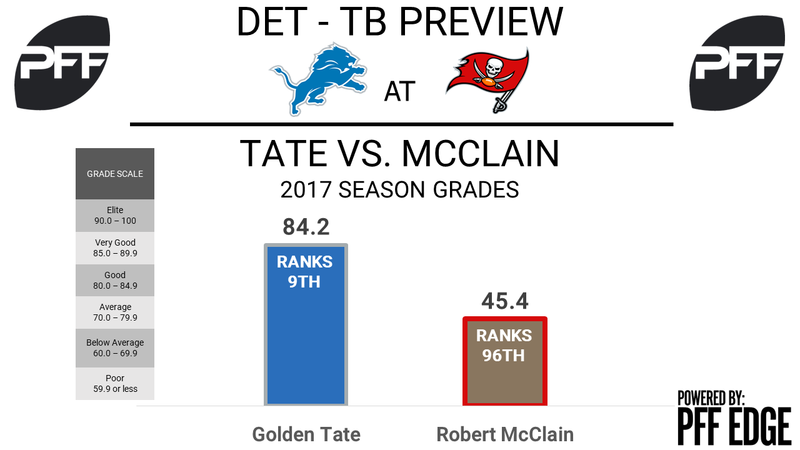 WR Golden Tate vs. Robert McClain – Despite the favorable matchup a week ago, the Lions couldn’t capitalize enough to keep the offense moving. Again, this week, Tate draws one of his more favorable matchups of the season. Coming into this game, Tate ranks ninth among receivers in overall grade with a mark of 84.2. Among receivers with 20 or more receptions from the slot, Tate ranks first with a catch rate of 79.7 percent. Per usual, Tate is the most dynamic receiver in the league after the catch, ranking first in forced missed tackles with 19. McClain, on the other hand, has been shaky at best. His 45.4 overall grade ranks just 96th out of 115 qualifiers. While covering the slot, no cornerback in the league has allowed a higher catch rate than McClain’s 83.8 percent, which isn’t ideal considering how efficient Tate is. McClain has also struggled with missed tackles this year, most evident in his 103rd-ranked tackling efficiency of 5.4 while defending the pass. T Taylor Decker vs. Edge Ryan Russell – Decker’s struggles after his return from injury continued on into last week’s game, where he not only struggled as a run blocker but allowed three pressures on the quarterback. Decker comes into the game owning the 62nd-highest grade for a tackle at 46.4 overall. If there is a week Decker can get back on track, this could certainly be the one, as he matches up with the lowest-graded edge defender league-wide in Russell. He has been almost non-existent as a pass-rusher, producing just 14 pressures on 221 pass-rush snaps and failing to record a single sack. His pass-rush productivity of 4.8 ranks 107th out of 109 edge defenders. WR Kenny Golladay vs. CB Ryan Smith – Golladay’s rookie campaign hasn’t gone quite as planned, missing several games with an injury. However, after making his return Week 10, he has been a solid contributor to the Lions’ offense. Most notably, he has caught three deep passes (20+ yards in air) over the past four weeks. He matches up with Smith, a replacement for the injured Vernon Hargreaves. Since taking over as a starter, Smith has been a complete liability in coverage, surrendering a passer rating against of 128.1, the fourth-worst mark among 116 qualifiers. Has allowed four touchdowns on just 46 targets to go with the fifth-most yards per cover snap of 1.84. His overall grade of 55.2 ranks 80th. Lions quarterback Matthew Stafford has been one of the most productive deep passers in the NFL this season and could look to exploit this matchup. 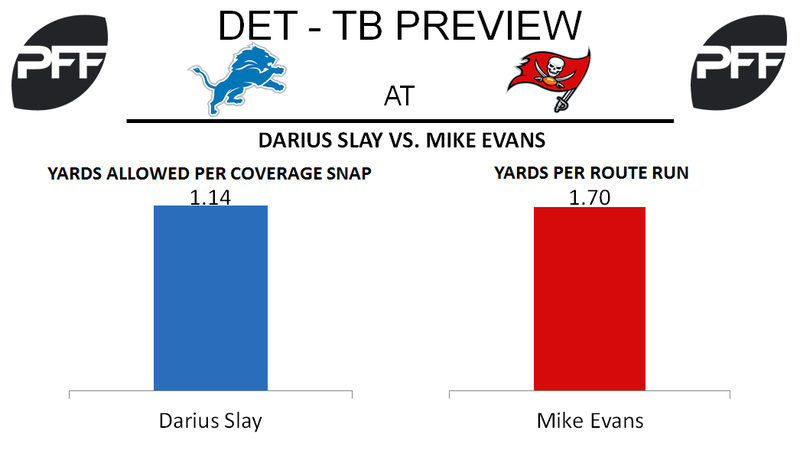 WR Mike Evans vs. CB Darius Slay – Buccaneers wide receiver Mike Evans has had a difficult time breaking through for that enormous game that Buccaneers fans have come accustomed to over the past few years. Despite having a down season compared to his standards, Evans still leads the team in yards per route run with an average of 1.70. He will look to find that breakthrough game this weekend against Lions cornerback Darius Slay. Often tasked with shadowing the opposing team’s No. 1 wide receiver, this means potentially Evans and Slay will be going against one another most of the game. Slay has held his own despite going up against some of the league’s top wide receivers by allowing 1.14 yards per coverage snap, which ranks 60th out of 119 qualified cornerbacks. TE O.J. Howard vs. S Glover Quin – Buccaneers rookie tight end O.J. Howard came into the 2017 season as one of the most coveted tight end prospects in recent memory. Howard has played on about 66 percent of snaps this season and currently ranks seventh out of 27 qualified tight ends in deep passing yards with 137 yards. The Lions will look to limit Howard’s yards on such passes by using safety Glover Quin in pass coverage. Quin is one of the league’s best safeties and is having his highest-graded season of his career by earning an overall grade of 87.7, which ranks ninth out of 89 qualified safeties in overall grade. T Caleb Benenoch vs. Edge Anthony Zettel – Lions edge defender Anthony Zettel has been a pleasant surprise this season. Zettel played sparingly last season, but he has turned into one of the best pass-rushers on the team in 2017 and has produced a pass-rush productivity rating of 9.9. Buccaneers tackle Caleb Benenoch started his first game of the season last week for the injured Demar Dotson and struggled. Benenoch earned a game grade of 46.8 last week and will look to improve on that game this week while often being lined up against Zettel.